The Plum Island Animal Disease Center (PIADC), located on a 180-acre site off the northeastern tip of Long Island, New York, is part of the Department of Homeland Security's efforts to protect the United States food supply. PIADC works to protect U.S. consumers and safeguard the integrity of U.S. animal product exports against biologic agents introduced accidentally or deliberately introduced by terrorists. PIADC scientists protect American livestock by developing methods to identify and isolate foreign animal diseases. PIADC scientists have developed testing, containment, and treatment protocols for a range of foreign animal diseases including foot-and-mouth disease, African swine fever, and African horsesickness. PIADC researchers are specifically responsible for developing a number of antiviral drugs and vaccines for foreign animal diseases and for the development of disease-specific nucleic-acid-based probes that serve in diagnostic tests. 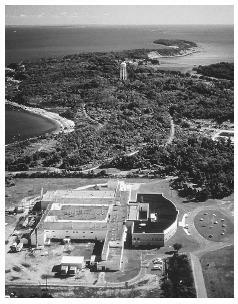 The Plum Island Animal Disease Center in Plumb Island, New York, is shown in an aerial view. Researchers at the facility focus on animal diseases that can affect the health, security, and economic interests of the United States, such as the prevention of a foot-and-mouth disease outbreak introduced into the country by foreign livestock and travelers. prevent non-specific binding. Antibody binding is measured as the amount of radioactivity retained by the coated wells in radioimmunoassay or as fluorescence emitted by the product of an enzymatic reaction. PIADC scientists also sequenced (i.e., determined the specific sequence of nucleic acids) the DNA of the African Swine Fever virus, which, as of March 2003, was the largest animal virus ever sequenced. The work at PIADC allowed researchers to compare the genome of the African Swine Fever virus with the genomes of the human immunodeficiency virus (HIV) and human herpesvirus 6. The genomic comparisons provided evidence that the disease (African Swine Fever) was not causally related to either HIV or human herpesvirus 6 infections. PIADC cooperates with industry to produce livestock vaccines. In addition, PIADC personnel conduct diagnostic investigations for suspected cases of foreign or emerging animal diseases and train veterinarians and other animal health professionals in the diagnosis of foreign animal diseases. PIADC facilities operate at or above Biosafety Level 3 (BSL-3) standards, and general safety protocols require the use of airlocks, HEPA (High Efficiency Particulate Air) filters, and other specialized vents and filters that remove any virus particles from air leaving the laboratory. Materials leaving laboratories are decontaminated, with waste products incinerated or specially heat-treated to kill viruses. The relative isolation of PIADC's setting and scientific containment facilities allow high confidence in the safety of pathogen storage and testing at PIADC. As of March, 2003, PIADC had never recorded a loss of pathogen containment. PIADC research supports work carried out by the United States Department of Agriculture (USDA) Agricultural Research Service and the USDA Animal and Plant Health Inspection Service. Plum Island Animal Disease Center. < http://www.ars.usda.gov/plum/index.html > (March 23, 2003). United States Department of Energy, Office of Science. National Laboratories and User Facilities. < http://www.sc.doe.gov/Sub/Organization/Map/national_labs_and_userfacilit es.htm > (March 23, 2003). United States Department of Homeland Security. Research & Technology. < http://www.dhs.gov/dhspublic/display?theme=27&content=374 > (March 23, 2003).